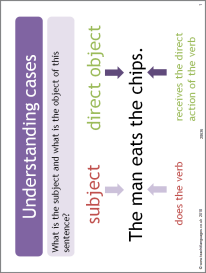 This PowerPoint introduces the nominative, accusative and dative cases. The slides can be printed as handouts, and there are translation and gap fill tasks to apply this knowledge. Answers will appear in the PowerPoint. Good clear resource. I gave the pupils the practice sentences with initials of each word, in jumbled order and taking out capitals for higher ability. Then I got pupils to make their own acronyms from sentences in their text book to use as pair work practise. I will be using this resource with all of my year groups from year 9 upwards. The slides are very clear and concise. Recht vielen Dank dafuer. This looks fantastic-clear and simple...thanks...will use from yr 9 and beyond!